This event is running from 3 March 2019 until 1 December 2019. It is next occurring on 7 July 2019 1:00 pm. 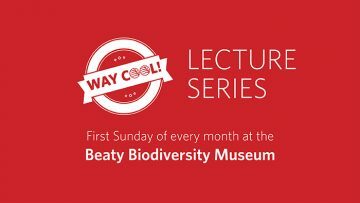 Join us for a talk, led by a biodiversity researcher. Explore way cool topics from ecosystems to microbes – open to all visitors and guests change every month. Monthly lectures will take place on the first Sunday of every month. Events will be updated with their specific topic as they are known, so save the date! Keep an eye on our calendar for more information.